Documentum Business Object Framework which was introduced from Documentum 5.3 plays a key role in most of the current Documentum implementations. Service-based Object is one of the basic members of Documentum BOF family. Let’s try to see what makes Service Based Objects very popular and how can you implement it. 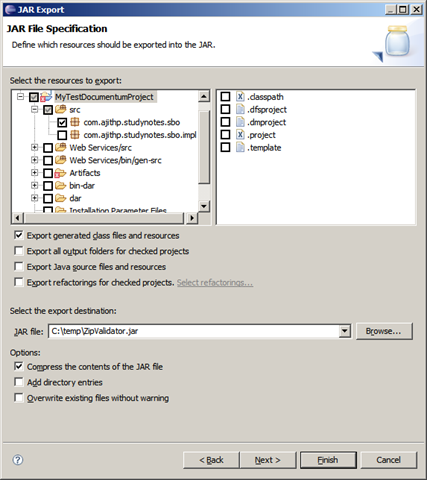 In simple terms, SBO in Documentum can be compared to session beans of the J2EE environment. SBO enable the developers to concentrate just on the business logic, and all the other aspects will be managed for you by the server. This reduces the application code significantly and reduces lots of complexities. The most significant advantage of a BOF that it’s deployed in a central repository. The repository maintains this module and DFC ensures that the latest version of the code is delivered to the client automatically. Service-Based Objects are repository and object type in-depended that means the Same SBO can be used by multiple Documentum repositories and can It can retrieve and do operations on different object types. SBO’s can also access external resources, for example, a Mail server or an LDAP server. Before the introduction of Documentum Foundation Services, SBO’s were commonly used exposed to expose Documentum web services. A very simple to understand example for an SBO implementation would be a Zip code Validator. Multiple object types might have Zip code across multiple repositories. So if this functionality is exposed as an SBO, it can be used by the custom application irrespective of Object types and repositories. This Validator SBO can be used even by different TBO’s for validations. SBO’s are not associated with any Documentum object types. SBO information is stored in repositories designated as Global Registry. 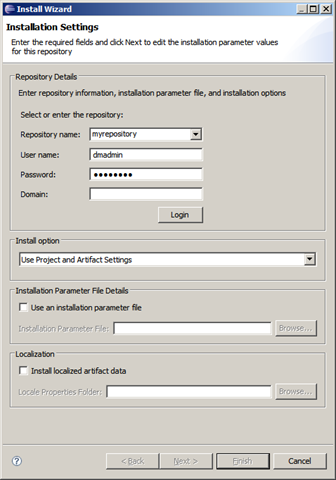 SBO’s are stored in /System/Modules/SBO/<sbo_name> folder of repository. <sbo_name> is the name of SBO. The steps to create an SBO are these. 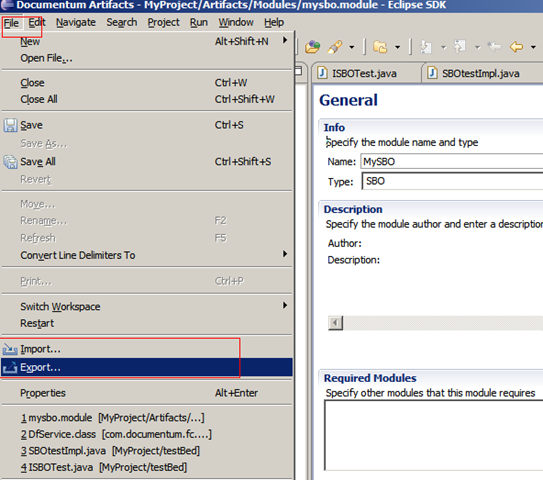 Let’s see these steps with an Example SBO Zip Code Setter, I am not covering the steps using application builder here. 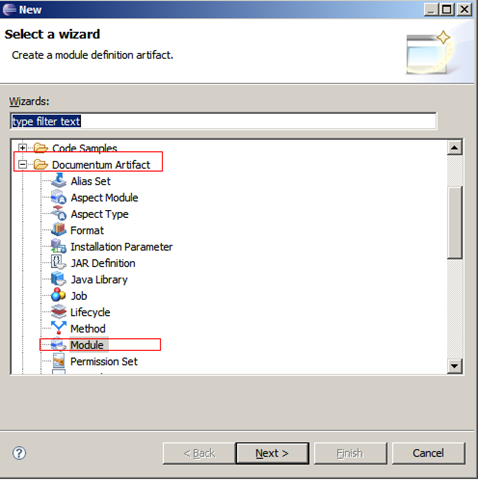 The screenshots and the notes will give you an insight into how to use Documentum Composer to implement a Service Based Object in Documentum version 6 or above. The first step is to create an interface which will define the business functionality. This interface should extend IDfService interface. 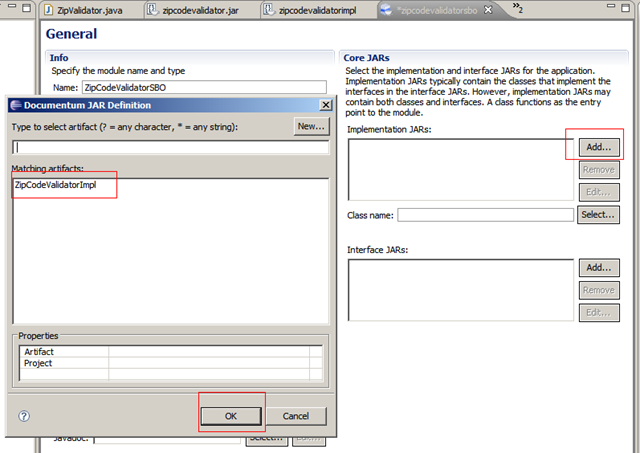 The client application will use this interface to instantiate the SBO. Now Add the Business method ValidateZipCode() to an interface. The code should look like the following. getVendorString() String This method’s default implementation returns a empty String. Override to make changes to it. getVersion() String This method returns a version which is not right, Override this method to return Major.minor version. Let’s see some other important methods of DfService Class before we move further. 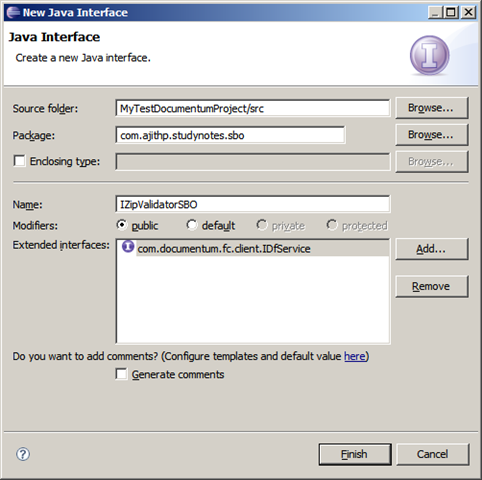 getSession() IDfSession This method returns IDfsession Object for the docbase name which is passed as argument to this method. You have to make sure that you call releaseSession() after you are done with the operation that involves session. 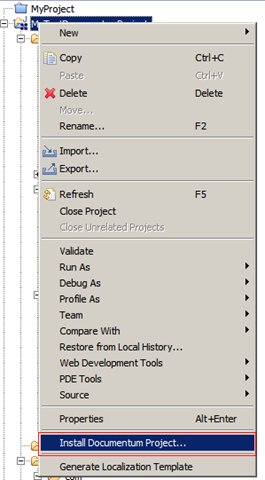 releaseSession() Releases the handle to the session reference passed to this method. getSessionManager() IDfSessionManager Returns the session manager. Managing repository sessions in SBO As We saw the previous table its always good practice to release the repository session as soon as you are done with its use. So the ideal way to do this should be like this. Another important thing is to know is how to handle transactions in SBO. Note that only session manager transactions can be used in an SBO. The system will throw an Exception when a session based transaction used within an SBO. beginTransaction() will start a new Transaction and use commitTransaction() to commit it or abortTransaction() to abort a transaction. Always ensure that you are not beginning a transaction where another transaction is active. You can use isTransactionActive() to find out whether a transaction is active or not. Another important point is if your SBO doesn’t start a transaction don’t commit it or abort it in the SBO Code instead if you want to abort the transaction use setTransactionRollbackOnly() method. 2) Always try to make SBO’s stateless (Its a pain to manage state full SBO’s ). 3) Don’t reuse SBO, Always create a new instance before an operation. 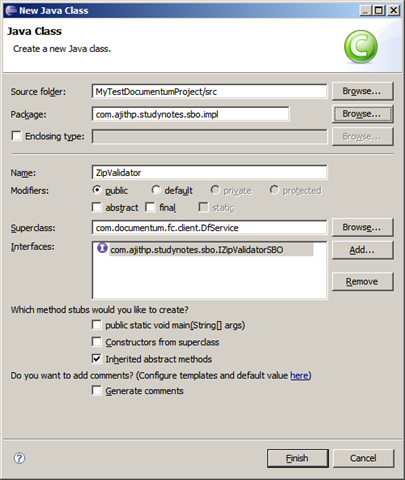 Click on New –> Class, Click on the Browse button of Superclass and Search and Select DfService and in the Interfaces search for the Interface created in the previous step and Click OK. Also, select the option Inherited Abstract Methods in Which method stubs would you like to create. I had overridden method getVersion() for the illustration purpose. See the code sample for the inline comments. // implement your logic to validate zipcode. 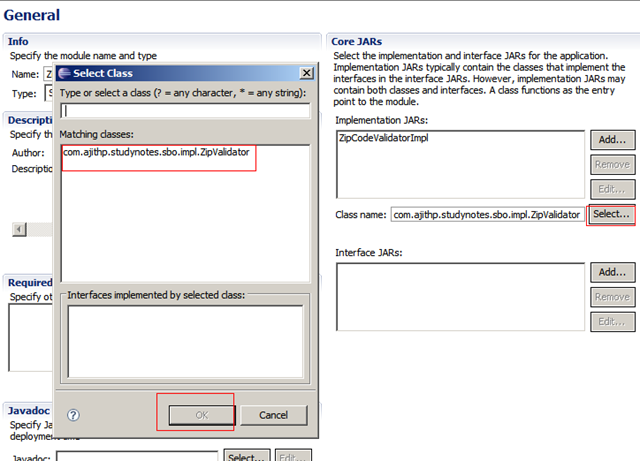 The next step in SBO creation is to create Jar files which will hold the interface and the implementation classes. These jar files are required to deploy your SBO. Selecting the com.ajithp.studynotes.sbo.impl for implementation. 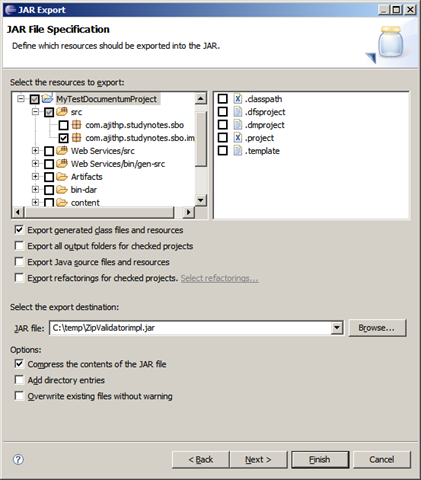 Look at the Composers Export Jar screenshots for Interface and implementation (Refer Eclipse Documentation for more details). I think the figures posted above are self-explanatory. The Command line to create a Jar file is jar cf <name_of_jar>, Please look at the Java Documentation for more details on switches and options of Jar command. 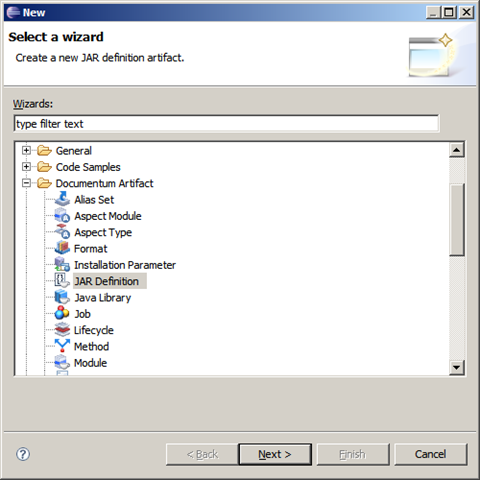 The creation of Jar Definitions is new step added in Composer. 3) Select Type as Interface if the jar has only interface, Implementation if the jar has the only implementation of interface or Interface and Implementation if the single jar file has both interface and implementation. Click on the Browse button and browse to the jar created in the last step. 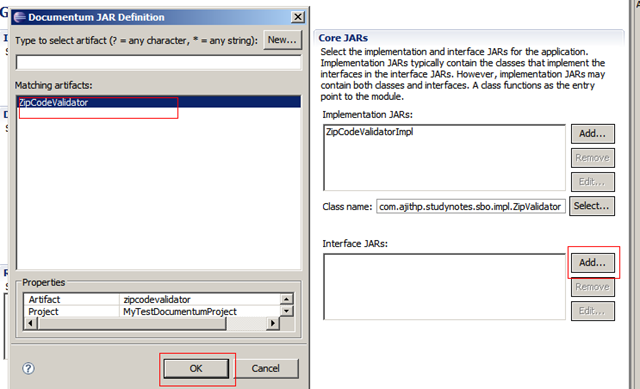 Now Click on Add Section of Implementation Jars of Core Jars. A new pop up window will appear which will have a list of all the Jar definitions set to Type Implementation and Interface and Implementation. Select the one you wanted to use for ZipCodeValidatorSBO that is ZipCodeValidatorImpl. Now Click on Add Section of Interface Jars of Core Jars. A new pop up window will appear which will have a list of all the Jar definitions set to Type Interfaces and Interface and Implementation. Select the one you wanted to use for ZipCodeValidatorSBO that is ZipCodeValidator. For more details of other options refer to Documentum Composer Manual. Save the Module. Click on the Login button after logged in Click on Finish to start the installation. Look at the Documentum composer documentation to know more about the Installation options. follow the below steps to instantiate an SBO from a client application. 2) Create login info and populate the login credentials.